My mother sent me photos of a gorgeous Mother’s Day bento my stepfather got for her (and for himself too of course!) yesterday. It’s from Hikagejaya, a restaurant in Hayama, a town near Kamakura in Kanagawa prefecture (where Yokohama, where my mom lives, is too). I’ve written about Hikagejaya  previously ; it’s one of my favorite restaurants in Japan, and their bentos are just wonderful. It came in two layers in a faux wood bento box (I guess using real wood is not possible because of the price unfortunately). 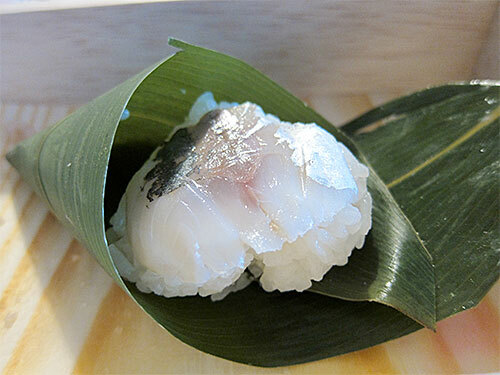 One had three kinds of rice - two of them, red bean rice (osekihan) and white rice molded together in kind of a yin-yang shape, and a bite sized horse mackerel (aji) sushi wrapped in the bamboo leaf, which I think is their signature. The other compartment has a bewildering array of items - my mother said she counted about 30 in all; fried, simmered, grilled and so on. The green leaf is a tiny molded bit of broad bean (fava bean) puree covered with matcha and fried. Can you even imagine trying to make that yourself? I can’t . 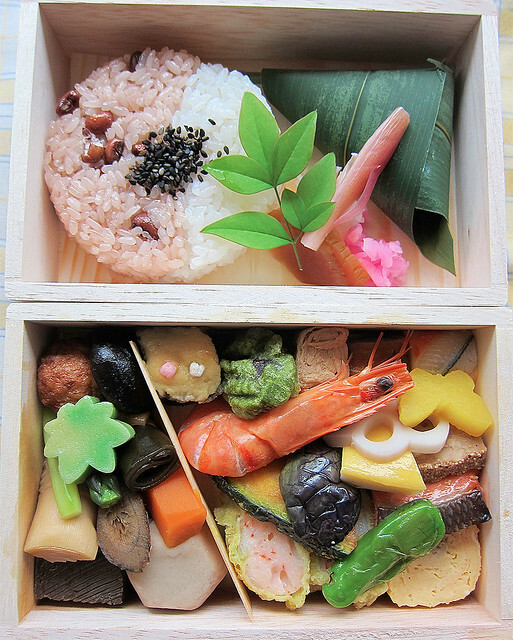 I am planning to go back to Japan in the fall, hoping I’m strong enough to travel by then (I’m still need to work on my fitness level…you need to be pretty fit to get around in the Tokyo area) and I can’t wait to have another Hikagajaya bento myself then! If you’d like to try their bentos, or their excellent restaurants (they have two, one a traditional Japanese one that has one Michelin star, and a French cafe) their website is in Japanese only  unfortunately, but they are easy to find in Hayama. They also have a little shop in Kamakura, where you can pick up a bento or an excellent super-buttery poundcake, and they also sell their bentos in the food hall at Yokohama Takashimaya.